James Henry Clay was born on 2 February 1911 in North Shields, Tyne and Wear. His parents, Robert and Mary Clay, had 12 children of whom James was the fifth. Robert Clay worked as a stonemason. 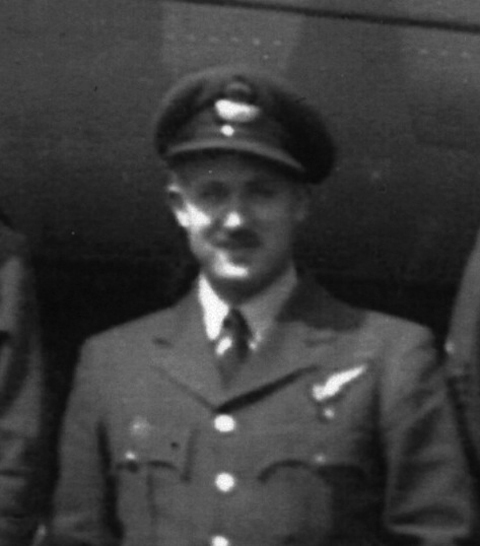 Clay was in fact in operation before the rest of his crewmates, having been allocated to the crew of another Canadian pilot, George Lancey, for the famous daylight raid on the Le Creusot works on 17 October 1942. This, however, resulted in an early return with engine trouble. The Cuelenaere crew were in action together ten days later, and began a run of almost 30 operations together which ended in March 1943, when their pilot reached the end of his tour. This coincided with the call for volunteers for the new 617 Squadron, which Les Munro and most of his crew decided to accept. However, as they were short of a bomb aimer, Clay volunteered to go with them. Clay settled in with his new crew and was in front row position on the Dams Raid when AJ-W was hit by flak while crossing the Dutch coast. He maintained that the damage came from a flak ship, disagreeing with Bill Howarth and Les Munro who both thought it came from a land-based installation. Clay wrote afterwards: ‘Then we were over Vlieland in the Zuider Zee (Waddenzee) when suddenly a flak ship opened up. None of us in the aircraft saw this vessel although we had, as customary, been keeping a sharp lookout. We must have been a sitting target to the gunners below, a close target silhouetted against the sky.’ John Sweetman quotes this account in The Dambusters Raid (Cassell, 2002) and adds: ‘Perhaps significantly, a detachment of 3/Marine Flak 246 stationed at the western end of Vlieland did report engaging “several Lancaster bombers” between 2257 and 2340 on 16 May.’ (p.180). Clay’s next operation was some two months later. He received a flesh wound to the nose caused by a bomb fragment when the Munro crew attacked an Italian power station, but flew a little too low over the target. They went on to land in RAF Blida, Algeria. Luckily, he made a recovery from this injury and went on to fly with Munro some 17 more times until May 1944. He was commissioned in November 1943, and received the DFC in July 1944. The citation said that he had completed 46 operations without a break. He served in various training units until the end of the war and left the RAF in December 1945. Jimmy Clay returned to Tyneside after the war. He worked as an accountant, and was married with two children. He died in Gosforth on 6 August 1995. Interesting that the flak ship reported engaging “several” Lancasters. I’m pretty convinced AJ-E got shot up going over the coast, and they may have gotten nailed here too.